Guess what this super seed does for your health: everything. It will send your blood pressure scurrying downwards. It’ll help relieve you from the daily troubles of type 2 diabetes. That throbbing pain in your joints from arthritis? This little guy will help with that, too. Did we mention that it’s also a weight loss aid? And that it’s packed with the dietary equivalent of dynamite, in the form of essential cardiovascular and brain nutrients? Boom. That’s how powerful this seed is. Chia seed plant is a shrub native to South and Central America, where it’s been valued and cultivated since ancient times. In the local language, “chia” meant strength, which explains why it’s known as a super-food and health booster. 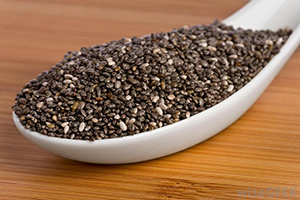 Chia seeds are loaded with this essential nutrient. As little as one ounce of serving provides 11 grams of dietary fiber –around one third of the recommended daily dietary intake. A high fiber diet has plenty of health benefits, such as maintaining bowel health, helping to lower cholesterol levels, aiding in blood sugar regulation, helping to control healthy weight, improving cardiovascular and overall health. The recent studies discovered that chia seeds are able to slow down the process of carbohydrate conversion to simple sugar, helping control blood sugar spikes. This discovery convinced researchers that chia seeds are extremely beneficial to type 2 diabetes patients. Chia seeds are loaded with manganese, the mineral crucial to bone health. Among other health benefits, manganese helps our bodies to process essential minerals, such as biotin and thiamin. One serving of chia provides 30% of the recommended daily intake of manganese. Phosphorus is another mineral in which chia seeds are abundant, and is also important to bone and teeth health. Our bodies need phosphorus for proper synthesis of protein to repair and grow cell tissues. These important minerals also help prevent high blood pressure and support cardiovascular health- great news for your ticker! Chia seeds are extremely rich in antioxidants which are vital in protecting us from disease-causing free radicals, cancer and aging. The rich content of antioxidants in chia seeds are also responsible for their super long shelf life. They can stay fresh for two years without refrigeration! A study published in the British Journal of Nutrition revealed that regular consumption of chia seeds lowers “harmful” LDL cholesterol and triglyceride levels while increasing “good” HDL cholesterol. The same study also discovered that substitution of chia seeds for other fat sources led to prevention of high triglyceride levels and lowered obesity. According to Cleveland Clinic, the consumption of chia seeds drastically improves blood pressure in diabetes patients and lowers unhealthy cholesterol levels. Another great reason to load up on this wonder seed is its extremely rich content in Omega-3. A great deal of evidence shows that Omega-3 fatty acids slash the risks of stroke, heart attack and cardiovascular-related deaths! Chia seeds contain as much as 5 grams of Omega-3 fatty acids in a 1 ounce serving. Chia seeds are unique for their quality to absorb water 10 times their weight, producing a bulky gel which helps a person feel full faster. This also helps avoid those in-between meal food cravings. Another quality of Chia seeds contributing to weight loss is its content in a specific amino acid –tryptophan, also found in turkey. This compound helps regulates appetite, sleep and improve mood. The list of this magic seed goes on..
• Chia is a great source of protein- a good solution for vegetarians and vegans. The great news is that chia seeds are becoming a modern trend in the natural health world, so you can buy them in most of the health food stores across the globe or check the online stores.